If you are comfortable ordering oysters at a restaurant, we’re going to let you in on a little secret: eating oysters at home is even more fun, and fantastic as an icebreaker at parties. 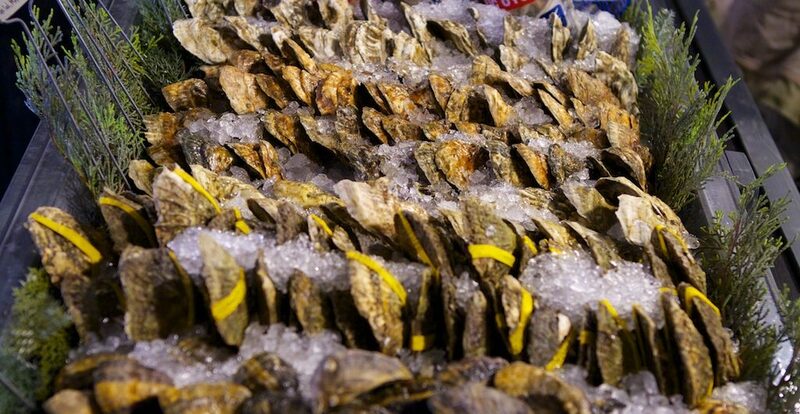 Have you ever wanted to shuck your own oysters or host a blow-out oyster party? You can pull it off with ease and panache, plus you’ll save a considerable amount of money by shucking your own oysters compared to restaurant prices. Unfortunately, it can be difficult to find a diverse selection of fresh oysters for retail sale. Supplies at many grocery stores are limited, and staff members are not always knowledgeable about their products. Your best bet is to find a reputable fishmonger with high product turnover (we like Greenpoint Fish & Lobster), or an oyster wholesaler who is willing to sell to the public, like us. Like lobsters, oysters must be purchased live. That means you must take care to keep them happy until you’re ready to eat them. A tightly closed oyster is usually a live oyster, however sometimes oysters may gape or open their shells. If you tap the oyster gently and it closes again, it is still alive. However, if it remains open, throw it out. Oysters should also feel heavy and full, not empty and hollow. If you tap two oysters together or shake the bag and hear a ringing sound, then most likely one of the oysters is dead and no one is home. If you ever have any doubts about the labeling at a retail counter, you can ask for the shellfish harvest tag. Don’t be shy! Retailers and restaurants are required by law to keep this on file for 90 days in case of recalls or illness, so they should be able to readily produce the tag for the oyster you’re inspecting.